← Best. Dumb. Metal. Song. Ever. This Is One Bugged-Out Talk Show. I was watching TV yesterday when, out of nowhere, a commercial popped on, featuring, of all people, Shawn Fanning, above, creator of the contraband late ’90s file-sharing service, Napster. 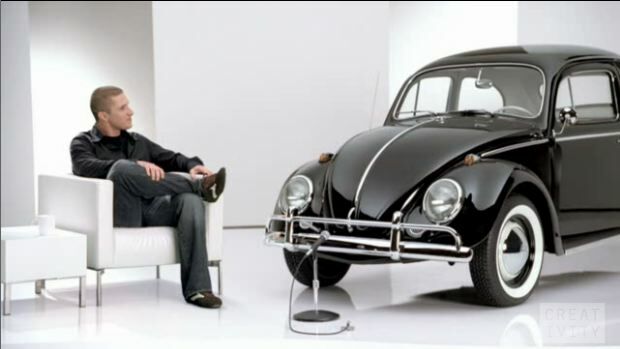 which launches today, will introduce the world to Max, an iconic, quirky, talking 1964 black Beetle. … In each spot, Max has candid conversations with notable figures from pop culture in a talk show setting. … Guests include supermodel Heidi Klum, pop and TV personality David Hasselhoff, Star Trek’s Leonard Nimoy, NASA astronaut Richard Searfoss, music-sharing innovator Shawn Fanning and former basketball coach Bob Knight. I’ve had Napster on the brain lately, since, hard as this may be to believe, next year will mark the tenth anniversary of the peer-to-peer music revolution Fanning started. I’ve probably never even said this before, but he remains one of my cultural heroes. That he isn’t exactly a household name makes it super-cool to see him in a national ad, looking grown-up, healthy, and happy, and not perturbed and beset, as he typically did during his outlaw years. What really makes this spot, and all the rest, most frosty, though, is the appearance of my gurl, überdrummer Cindy Blackman, right, perhaps best known to them asses for her powerwork with Lenny Kravitz, particularly in his videos: 1999′s “American Woman”; 1998′s “Fly Away” by Paul Hunter; and the Mark Romanek masterpiece, 1993′s “Are You Gonna Go My Way.” So, let’s tally it up: Blackman, Fanning, and a 1964 Beetle on a swivvy white ultramod set. It gets no better than this, friends. Dude…..I too dig Cindy. No Homo…but for her I’d consider it. 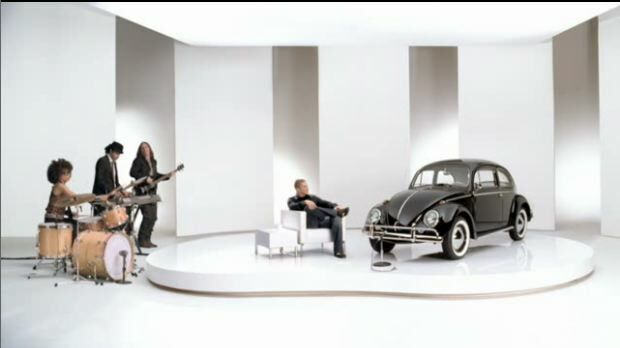 By the way, I love this series of commercials!